For more years than I like to remember, I’ve been trying to make the point to audiences around the West that grazing can benefit the land, in many cases more than preservation. I’ve probably put together a thousand slide shows displaying “befores” and “afters” and fence-line contrasts. I’ve shown how grazing has succeeded in restoring ecological function to land that was essentially dead, and how preservation has taken land that was functioning effectively and made it essentially dead. Recently, I’ve come up with a way of getting people out of their standard “grazing bad, protection good” way of thinking that gets especially good results. It consists of a series of side-by-side photos of two pieces of rangeland that are similar in all respects except management. In each of the cases, the condition of the pieces of land I have selected for these comparisons couldn’t be more different. On one side, the land is painfully barren. What plants do exist are obviously unhealthy. On the other side, the land is green and growing and diverse. Of course, everyone—enviros, ranchers, government staffers, someone who stumbled in off the street—picks the green and growing land. Who wouldn’t? And, after they’ve gone through the whole list—grasslands, deserts, endangered-species habitat, lands that have been mined, parks, riparian areas, vernal pools, etc.—it becomes clear that in every case they have chosen land that is grazed over land that is protected. The next question is the one that takes everyone, ranchers and enviros alike, out of their comfort zone. It does so because the answer is exactly the opposite of what everyone expects it to be. The photo comparison that accompanies this question is dramatic. 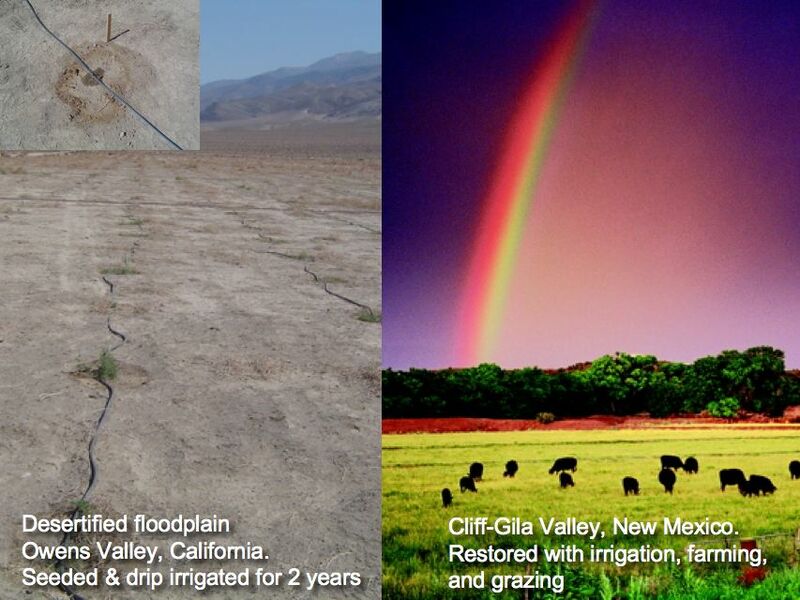 I don’t think you could take two more different rangeland photos in the western United States. This comparison shows, on one side, a large barren floodplain with drip irrigation hoses stretching futilely into the distance. Except for a few tumbleweed seedlings at a couple of drip ports, there is not a plant to be seen. An insert in the barren-land picture shows a close-up of one of the drip ports where water oozes out of the hose. Water stains the barren soil around the port, but even here there is not a wisp of green. The audience then learns this piece of land has been irrigated for two years as part of a restoration project devised by the best minds modern range science and ecosystem restoration consulting can muster. It is floodplain land that once raised crops, but has been exhausted. The farmer went bankrupt and abandoned it. In contrast, the other piece of land in the comparison is also a floodplain, It is covered with grasses that are iridescently green. Cows graze among the knee-deep grasses. The colors in this photo are so bright they look enhanced, but they aren’t. The only explanation I can give is that this effect is caused by the rainbow that happened to be present when Photographer Tom Bean and I were fortunate enough to get to this site. This land has been cropland, too, and has seen rough times as well. It, however, has been successfully restored and is sustained by the management of a rancher, David Ogilvie, who uses cows as part of his toolbox. As the audience looks at the world’s-apart contrast on the screen, I ask which of these two pieces of land is most valuable. The response is instant and emphatic. “The green land. The one with the cows!” Some of them even shout. Everyone likes to be right, and everyone knows you would have to be an absolute fool to believe the barren land on the left is more valuable. That’s why they’re all so surprised when I tell them they’re wrong. “What’s the green piece of land worth?” I ask. It produces a few burgers and maybe a few bales of hay every year. No big deal. How valuable is the wasteland? That land is owned by a major western city which is under court order to restore it or start paying significant fines. Think of all the bureaucrats who are being paid five- and six-figure salaries year after year to manage that land and, supposedly, to restore it. And as it has become obvious that they are failing, think of all the consultants who have been hired via six-figure contracts to come up with a method that would work. Think of all the grants secured by major universities to research the dilemma presented here because this problem is being repeated all across the West. And then think of all the lawyers who are suing the agency that is failing to restore this land to “natural conditions,” as the law requires, and all the lawyers the agency has hired to defend itself. To cap it all off, think of all the environmental groups which are using this dilemma, or one like it, to attract members and garner grants. In other words, the wasteland is worth thousands of times more than the healthy, green, and growing land, at least in terms of the amount of economic activity it creates. From this we can learn a lot. First of all, by “following the money,” we can learn that we’re going to end up with a lot more land that looks like the land on the left and a lot less that looks like the land on the right. We can also conclude that managers like Dave Ogilvie, who can give us land like that on the right, are going to be in less demand than managers who can give us the land on the left. Considering the above, ranchers can be fairly certain that making their land look like that on the right in the above comparisons is most likely not going to get them rewarded by, approved by, or accepted by environmentalists. It isn’t even going to cause environmentalists to stop opposing them so vehemently. How sure can we be of this? In every case illustrated above, the owners of the land on the left were approached with a credible proposal to make their land look like that on the right. In every case, the proposal included a management team that had succeeded several times in doing just that. And in every case, those entities chose to keep their land in the condition illustrated on the left rather than to have it healed or made as healthy and productive as the land on the right. There are exceptions to what I have just written. There are cases in which environmental groups support the use of grazing animals to achieve environmental goals. In California, cattle are being used to sustain vernal pools and the rare species that inhabit them. In a number of places around the West, goats and other animals are used to reduce fire danger and combat invasive non-natives. In each case, however, this spirit of collaboration is strictly limited to a specific situation and a specific location. The rule in environmentalist/rancher relations is that mainstream environmental groups continue to press to end grazing on all land on which management is controlled in any way by the government.